The CoolTouch CT3 and CoolTouch CT3Plus cosmetic laser systems have proven to be among the most effective systems available for non-ablative laser skin rejuvenation, wrinkle reduction, acne treatment and skin tightening. Both models feature a 1320 nm laser which provides exceptional results on all skin types. This system can also be used to target the sebaceous gland to prevent acne. There are certainly cosmetic laser systems that cost more than the CoolTouch CT3, but it’s hard to match the combination of value and performance in this model. When you add in the fact that SunrayLaser.com has used CoolTouch CT3 laser machines for sale at a cost of 60% or more off the retail price, that makes this system a great buy. Whether you prefer the CoolTouch CT3 model or the newer CoolTouch CT3Plus, SunrayLaser.com is the place for all your cosmetic laser needs. We only sell the finest quality pre-owned laser equipment we can find, and we guarantee your 100% satisfaction. 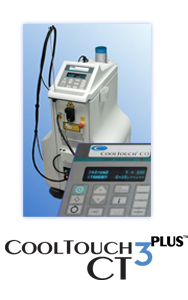 We make it simple to get a low price quote on a pre-owned CoolTouch CT3 laser system. All you need to do is fill out the contact form below and we’ll respond promptly with a free, no obligation quote. We like to let our prices and service speak for themselves, so we won’t give you the runaround if you are comparing prices or need more information about any model in our inventory.